Blog What are you basing that on?! Of course there are many approaches for basing and many effects you want or can achieve. With a diorama or display model the goal for a base becomes much more elaborate and can almost be as important as the models themselves. Sometimes even being the center of attention so special care can be given to a base without any real limitations. What I want to focus on here is basing for gaming models that will be used in significant numbers on a gaming table. The basic rule IMO is that bases should compliment the model but not draw attention away from it. In essence a base is simply a necessary transition area from model to gaming table to facilitate moving them around comfortably. In an ideal situation the base should almost “meld away” into the gaming table to give full focus on the models while still being practical to move them around. But you seldom find yourself gaming in ideal situations and you don’t always have a perfect gaming table to match your models or the other way around. That’s why it’s a sensible thing to base your models on bases with mostly neutral colors to not clash with most gaming tables. And because much of a base surface consists of a rim these should be in a neutral color if possible. Black, Grey, browns and some soft greens are ideal for this. These match the natural colors you find on most tables. Of course you have some exceptions like winter tables, deserts or even more extreme terrain tables that won’t match. But even then a neutral color on the rims won’t clash with a table too much. While this seems all pretty obvious there are some instances that people seem to forget this or simply ignore it. A good example I came across recently while diving into Warmachine is the extra front/back presentation on the base. While not being a problem in itself and easily done with subtle markings it also is sometimes done by painting the front rim of the base in the faction colors. 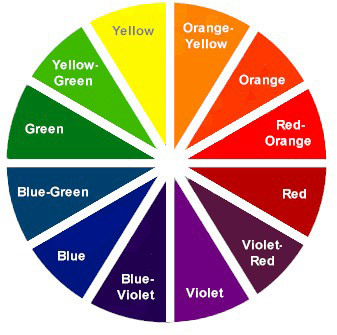 These are often bright colors and often the same color the models are predominantly painted in. This huge area of bright color often “competes” with the colors of the models and draws attention away from them. To take this in a wider perspective; A base-rim should be an “invisible” raised boundary between table and model. So next to the aforementioned example base-rims should not divert attention away from the model by adding bright colors, text or decorations of any kind. Another rare example is basing the rim as well as the top surface. This seldom looks good and even looks a bit silly as if the model is standing on an unnatural hill. Again, taking attention away from the model, albeit often unintentionally. Another practical thing this touches upon (pun intended) is that a base-rim is often used to move the model around and adding texture or detail makes it easier to damage the base. This also holds true for movement trays which often have a textured rim. I have to mention again that I’m talking about models intended for playing on a table. When we’re talking about display models all bets are off and elaborate bases/plinths with text and/or decorations are fair game. While this distinction may be obvious the lines are often blurred and many tabletop models receive a display base treatment to add to the flair of the models. It sometimes works but can often look very busy when placed in groups. The most common example of this is raising a model by adding a rock for the model to stand on. This can work extremely well with great effect but when applied to ALL models in a unit or even army it looses its desired effect and just looks too busy. Better to only use this for leader models or other special models to make them stand out. And even then it’s a good idea to not overdo it. Ideally a base should be neutral and not distract too much from a model BUT it’s highly recommended to have as much contrast between model and base as possible. This may sound contradictory but it doesn’t have to be. By adding a color contrast between base and model it can really help to set the models apart. This is not always possible depending on the color scheme of the models but the opposite should always be avoided. Don’t paint the base in the same color as the (main) color of a model. 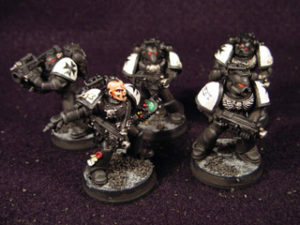 Black Templars make great examples; Putting them on a dark base will make it hard for them to stand out. A real shame when lots of time is put in highlighting the black armor. Don’t give a dark model a dark base or a light model an overly light base. 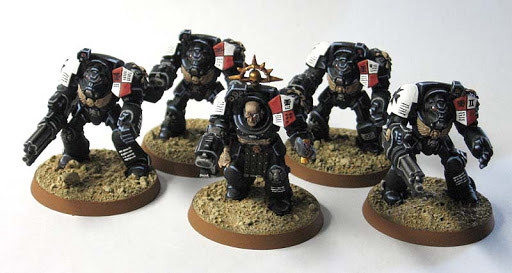 For example; Black or dark colored models on black or dark grey bases. Green models on overly lush green bases. Predominantly Yellow or brown models on desert bases. Very light or mostly white models on snow bases. Etc. Again, this might seem very obvious but it happens a lot. Simple reason is that the models and base are base-coated together so it’s simply less time consuming to use this color for the base as well. While fast and easy it really is worth the extra time and trouble to use some other colors on your bases. Only real exception is when your going for a camouflage effect for your models but even then I’d recommend trying to get some contrast in there. It can be subtle but it will avoid your carefully painted models to almost totally disappear on the gaming table. What does work wonders is consulting the color wheel and put as much contrast between model and base. Those Black (or dark blue) space Marines? 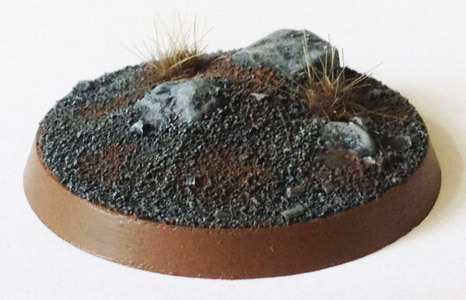 Put them on a desert or snow base instead of that grey industrial rubble base you often see. Red Khorne warriors? Add some greens on the base. 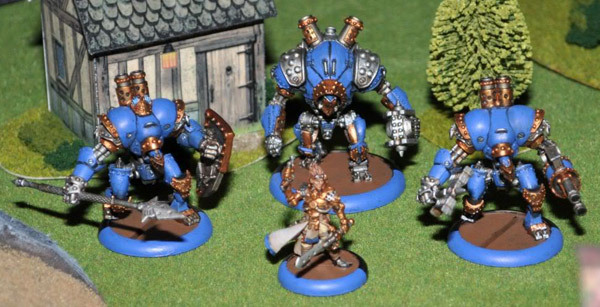 Royal Blue Cygnar models on reddish earth bases or desert bases. You’ll see models suddenly start to “pop” more. All sounds very simple no? But it really does help you to add that extra special to your miniatures no matter what your painting skills are. Even if you just put some basic sand or flock on your base it’s still worth considering the colors to help your models look better on the table top. And even skilled painters sometimes forget this or overdo it on their bases. Good luck painting! And don’t inhale too much of those paint fumes now will you?